Son of the diplomat Frank Rattigan, who once had an affair with Princess Elisabeth of Rumania, who later married George II of Greece. He was educated at Hattow and Trinity College, Oxford. In 1936 he had his fist succes as a playwright with "French Without Tears". In 1939 it was followed by "After the Dance". After the war he wrote dramas and comedies, among them "The Winslow Boy" (1946) and "Seperate Tables" (1954). During the 1950s critics began considering his work as old fashioned. But he didn't adapt his style and continued to write succesful plays. He was gay and had many different lovers, but as far as known no long term partners. In 1962 he was diagnosed with leukemia. He recovered in 1964, but fell ill again in 1968. He didn't like London anymore and moved to Bermuda during the 1960s, where he lived from his royalties. In 1971 he was knighted for his work for the theatre. He died in Hamilton, Bermuda. 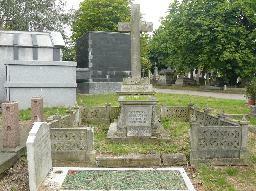 His ashes were buried at Kensal Green Cemetery in London in the grave of his grandfather W.H. Rattigan, a lawyer and Member of Parliament. The grave of T.M. Rattigan at Kensal Green Cemetery, London.